Yeosu International Art Festival is a biennial event that will be held from September 4th to September 21st 2014 at various locations (GS Caltex Yeulmaru, Chonnam University Art Center, and Chonnam University Art Gallery). What does the City require from us? 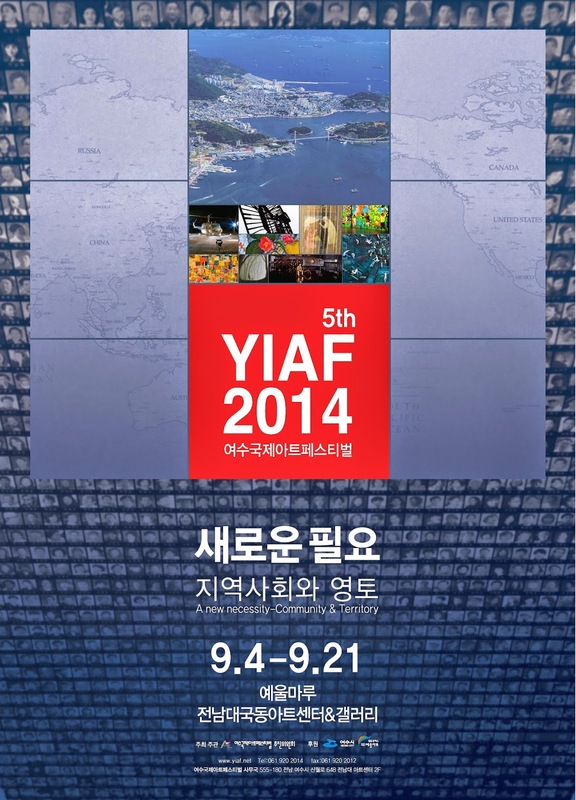 The commencement topic of 5th Yeosu International Art Festival is "Ever-changing City". The progression and overall development of a city is dependent on changes in political, economic, and social conditions. We, living in this organism like city, are at the epicenter of new change and requirements to fit in with the City's evolution. People living must understand and accept the community at large to really understand and accept the fundamental concepts of the living territory. For a City to have its' own colors and sensitive, it takes a combination of several elements and time for it to ferment to a level of completion. At this International Art Festival, invited artist-participants from 15 different unique countries gather around, questioning and looking for answers about the local societies that they're part of and also research into how to respond to the general standardization of different cultures, regions, genders, analyzing how to preserve the diversity and individuality within the local and global communities. Through this meaningful, 5th Yeosu Art Festival, we will look into new ways of progression for our local communities and territories in larger scale. Through this experiment, we hope to find new values and identities for the city of Yeosu. In addition, creating a wider world of thought, and expression through variety of genres of contemporary art, communicating with the locals and people abroad, the ultimate goal of this festival is to create an opportunity for cross cultural union. 격년제로 개최되는 여수국제아트페스티벌이 ‘새로운 필요 A new necessity’라는 대주제로 2014년 9월 4일 개막을 시작으로 9월 21일까지 18일간 예울마루, 전남대 아트센터, 전남대 갤러리에서 개최된다. 5회째를 맞이하는 이번 행사는 여수의 도시성과 세계 지역사회의 변화를 아우르는 성숙한 주제로 미술이라는 매체를 우리의 삶에 녹여 더욱 친밀하고 함께 공감할 수 있는 장을 선보인다. 예술가들은 새로운 창작물을 대중들에게 선보이고 관중들은 예술가들이 자신의 사유와 문제의식을 창작물로 어떻게 풀어내고 있는지 다양한 방법론을 제시한다. 제5회 여수국제아트페스티벌 주제의 출발은 변화하는 도시다. 하나의 도시는 정치, 경제, 사회적 여건의 변화에 따라서 끊임없이 진화하고 발전하다. 우리는 그 속에서 그 도시가 요구하는 새로운 요구에 맞추어 삶을 변화시킨다. 우리가 살고 있는 도시가 그만의 색깔과 감수성을 갖기까지는 여러 가지 요소가 복합적으로 녹아 들어 오랜 시간 동안 축적되어야만 한다. 또한 그 지역에 살고 있는 인간이 자신의 지역사회와 영토를 숙지하고 받아들이며 그 도시의 개념은 형성되어갈 것이다. 한 인간이 속해있는 물리적 기반인 영토, 즉 땅과 사회적, 정치적 시스템인 지역사회 두 축을 기반으로 알아본다. 이번 국제전시에는 15개국에서 초청되어져 온 많은 작가들이 각자 자신이 속한 지역사회와 영토에 관해 질문하고 스스로 답을 찾고 있다. 이 작업들은 각기 다른 문화와 지역성에도 불구하고 표준화되고 획일화 되어가는 도식에 맞서 지역사회와 영토의 개별성과 다양성을 지키고 타 지역과 호흡해 나아가는 방식을 보여준다. 도시 여수는 그 어떤 도시보다 빠르고 활발하게 변화하고 있다. 사회와 경제가 변화하면서 여수의 정치적, 사회적 위치도 변화해 온 것이다. 이것은 여수 시민에게는 지역사회를 돌아볼 수 있는 계기를 만들 것이고, 도시 여수의 개념을 머리 속에 형성하고 있는 지역 외의 타자들에게는 여수의 지리적인 입지와 영향력을 환기시켜 새로운 시대의 새로운 여수를 위한 담론을 탄생시킬 것이다. 이번 여수국제아트페스티벌을 통해 지역사회와 우리의 영토를 바라보고 해석해 나아가는 방식을 제안하고자 한다. 이러한 과정을 통해 변화하는 여수의 정체성을 기반으로 하는 새로운 모습이 떠오를 것이다. 아울러, 다양한 장르의 현대미술을 통해 보다 넓은 세상의 많은 사람들의 생각과 표현을 보고, 그들과 예술로서 소통하여 지역작가들을 해외에도 알리는 역할을 마련하며, 타 문화를 거울삼아 우리지역의 독창적인 문화를 비쳐보고 향유하는 계기를 만드는 것 또한 본 축제의 궁극적인 목표가 될 것이다.